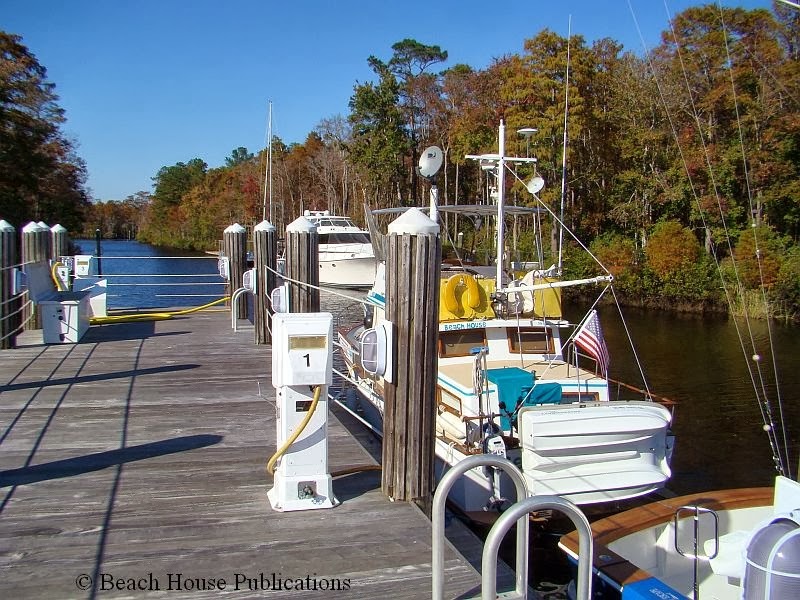 If we plan any marina stops along this stretch of the ICW, Osprey Marina is the place we stop. The staff is always very helpful, the fuel prices are usually the best in the area and the basin is extremely well-protected. Our reason for stopping was to top off the fuel tanks and make sure the marina had sufficient inventory of our books. The marina office has a small ships store, where they carry The Great Book Of Anchorages and offer an excellent complimentary continental breakfast in the morning. There was a grill that offered sandwiches and light fare, but sadly, it is closed. There was just not enough business to make it profitable for the owners to continue. The drive off the main road to the marina is a good walk for exercise, and the goats that run to the fence as you walk by are entertaining. We suspect they usually get treats from passersby, but we had none at the time. The next morning after a yummy breakfast, and with fuel and water topped off, we headed out of the basin. We did mention how protected the marina basin was. The forecast was not good for the next few days, but the Waccamaw River has many, many, protected anchorages. As soon as our bow entered the river once again, the 20-knot wind gusts hit us. Fortunately, the wind would be on our stern as we headed down river and the next stop was only about 10 miles away. The temperature was decidedly chilly and the 15- to 20-knot winds made it feel more so. This was an inside steering station day. As we moved down river, we cruised through some of the anchorages in our book to check depths and to see if anything had changed since our last visit. 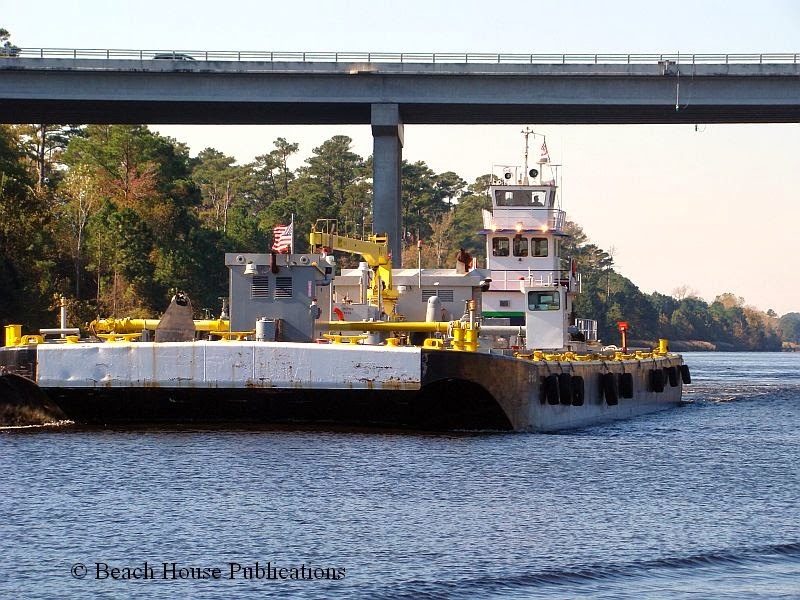 Traveling on the Waccamaw, it is necessary to keep a sharp lookout for flotsam and jetsam. There were a couple of deadheads just out of the channel. A deadhead is a log that is floating in the water, typically with only the top end sticking up and the bottom end near the bottom of the river. These can do serious damage to the hull, props and rudders if you hit one, especially if the boat is doing any speed. When encountered, it's always a good idea to make an announcement over the VHF to let others in the area know of the location. 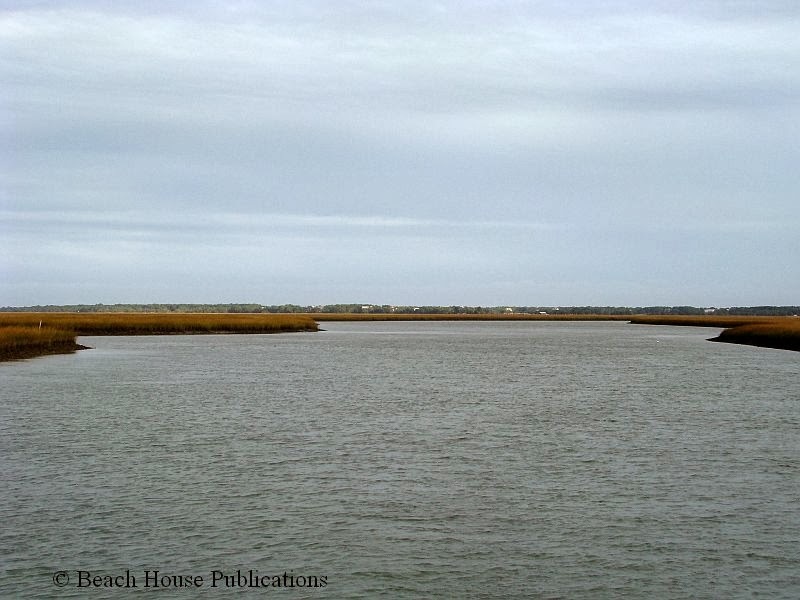 In a little more than an hour, Beach House turned off the river into Bull Creek (page 22, The Great Book Of Anchorages, Norfolk to Key West). We had not been in this anchorage for a while and it's always good to revisit. It's almost like experiencing the places again for the first time. We found a good spot in the center of the creek and dropped the anchor. Our practice is to always back down on the anchor once the proper scope has been let out to be sure it's set. This time we were dragging, so it required the anchor be hauled back up to try again. It appeared we had snagged something which was preventing the anchor from setting. Snags along these rivers and creeks are not at all uncommon and a trip line connected to the anchor can sometimes be a good idea. This time it wasn't necessary and we pulled up the anchor, moved to a different spot and it reset just fine. 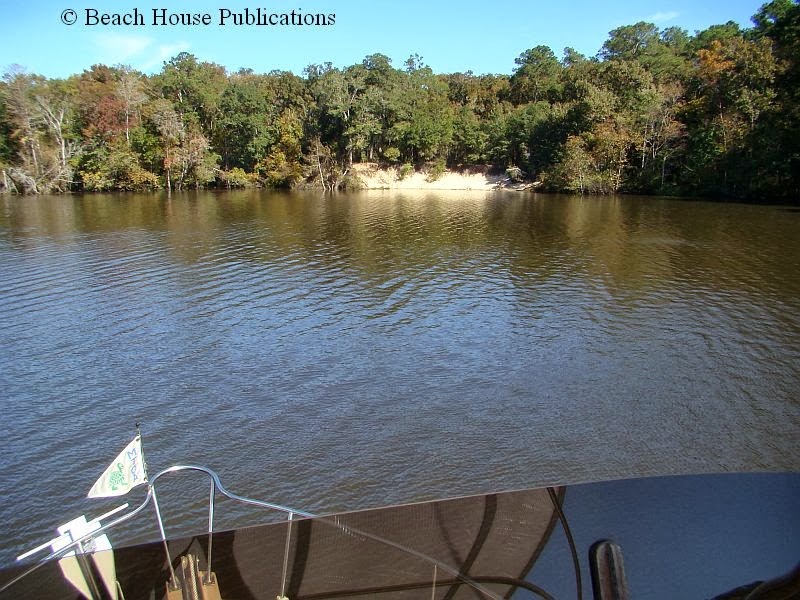 Bull Creek is another one of those beautiful and peaceful anchorages along the Waccamaw River, and protection from any wind direction can be found, depending on where along the creek you anchor. By now, the winds were starting to blow themselves out, and the next morning the plan was to move on to Georgetown. On the way to Georgetown (page 24, TGBOA, Norfolk to Key West), we took a few more detours to check anchorage depths. The morning was drizzly and foggy, but the winds were much lighter. By the time Beach House reached Georgetown, the rain was coming down pretty good. Soon after settling in, of course, the rain stopped. Our main reason for stopping, aside from the fact that we really like Georgetown, was to see for ourselves the aftermath of the devastating fire that took out an entire block of the historic waterfront. We also wanted to check on the progress of those affected by the fire in relocating their businesses, including another vendor of our books, Harbor Walk books. Additionally, Claiborne Young had asked us to write up a report for his website, Cruiser's Net. 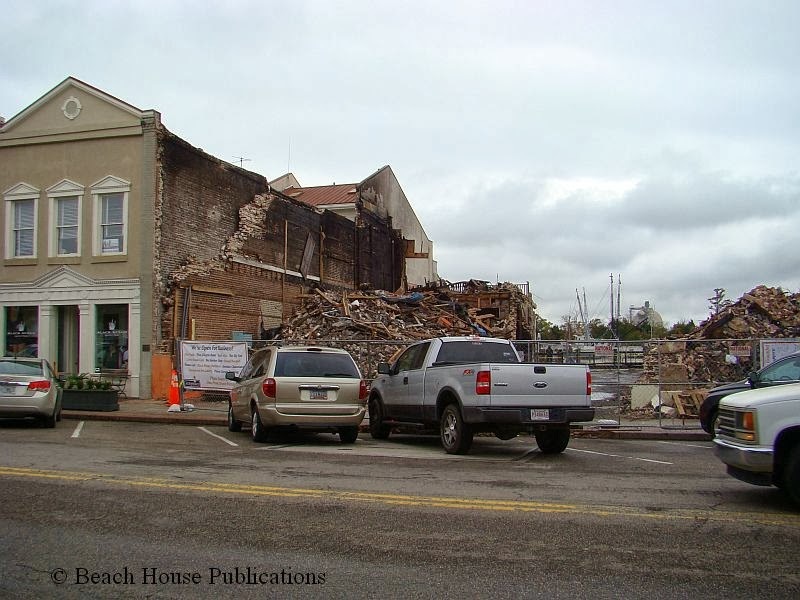 The buildings that had burned were little more than a pile of rubble, but almost every business had relocated and was either open or would open soon. It was fortunate that no one was injured, but since there were apartments above the businesses, some folks found themselves in need a of new home. We spent the evening enjoying the shops and a restaurant in the downtown area to celebrate Susan's birthday. This would be a quick stop since we wanted to get down Winyah Bay and back on the ICW before the next round of high winds. 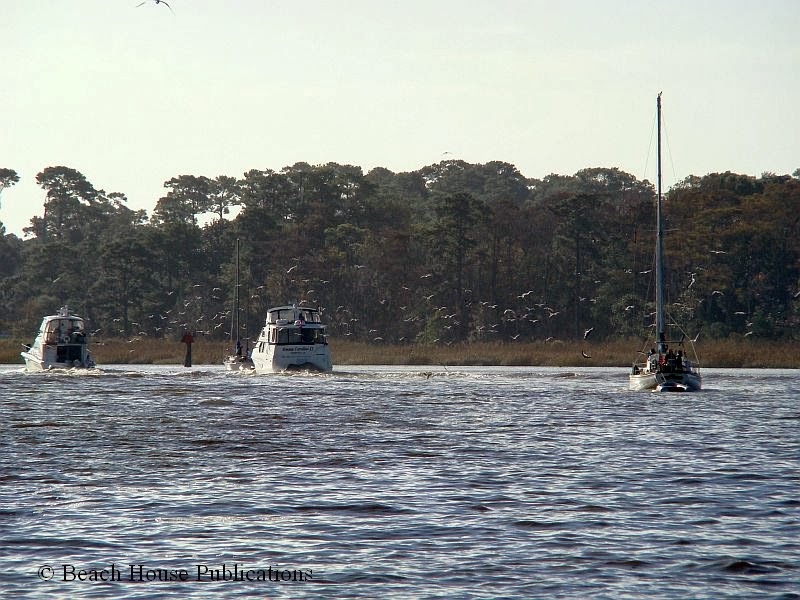 Timing is also important in transiting Winyah Bay. The tides and currents can be very strong, and heading down the bay against the current can be a long, slow trip and if the wind opposes the current - a very bumpy ride indeed. From Georgetown to the ICW turn off is about 12 miles. Our tide and current tables didn't seem to agree with the currents we encountered on the bay and it took about an hour and a half to make those 12 miles. This did put the wind and tide from the same direction so the seas state was not bad at all. The winds had reached the 15+ range and were forecast drop for the next couple of days. This was good news for crossing Charleston Harbor so a push for miles was the order of the day. Crossing Charleston Harbor wasn't going to work for us in one day, but we could get ourselves pretty close and make the crossing early the next day while the winds were still light. There are a couple of good options for anchorages just north of Charleston. The day was sunny off and on, but the temperatures were still cool for this time of year and this far south. Beach House left Georgetown Harbor around 0800, and at 1500, turned into Dewees Creek just north of Charleston (page 29, TGBOA, Norfolk to Key West). Dewees Creek is little more than a deep swath cut through the marsh grass of Hamlin Sound. There are sections that measure 80 feet deep. During high tides, the marsh grass can be under water and it appears your are anchored in the middle of a lake. And at high tide, an accurate chartplotter is needed to navigate the channels. We found a spot that was only 10 feet deep at low tide in which to anchor. There is no protection here from winds, but good protection from waves. The night was uneventful other than the rain which had plagued us for days, and the next morning we were underway as soon as we had sufficient light. 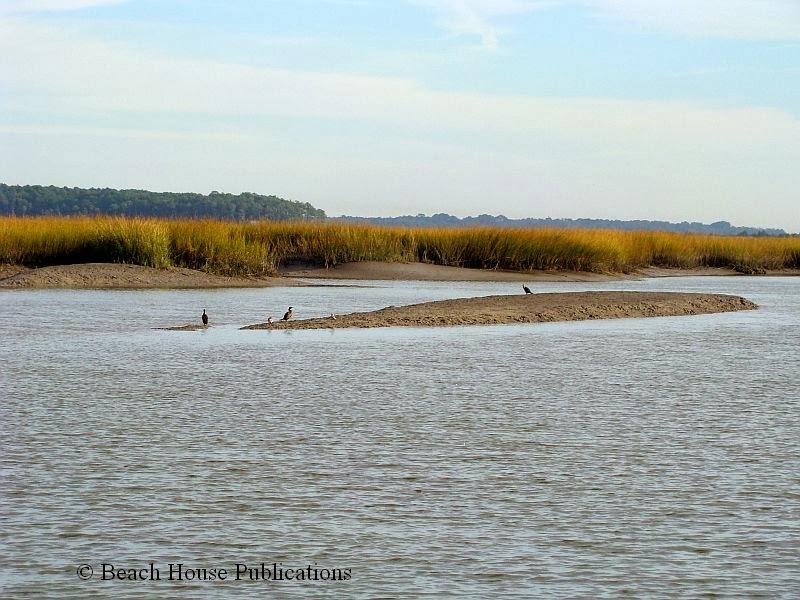 The stretch between Dewees Creek and Charleston Harbor has some very shallow spots, especially near the Ben Sawyer Bridge, that have not been dredged for a very long time. 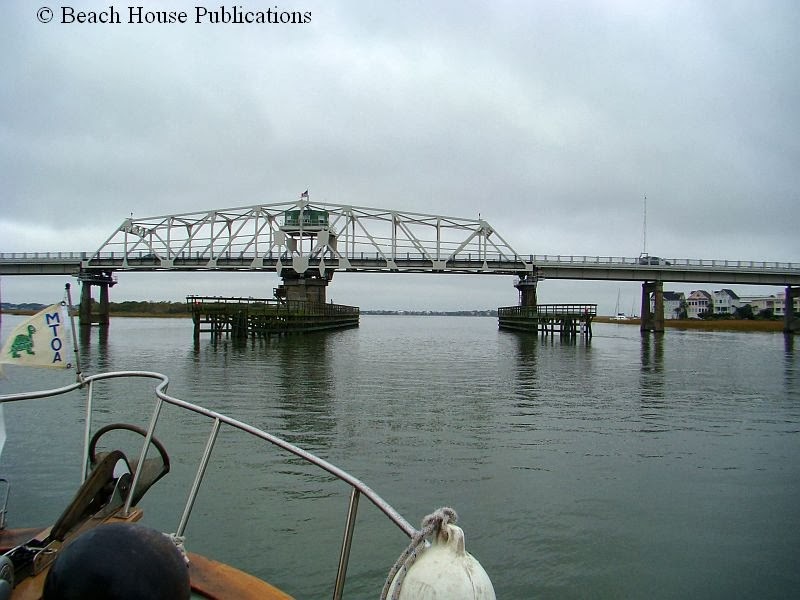 As we approached the Ben Sawyer Bridge, depths in the channel averaged 6 to 7 feet at low water. There are a few spots that we found to be only 5 feet at low tide. Another problem is the cross currents at the inlets that will quickly push a boat out of the channel and off to the side where depths can be as little as 3 to 4 feet. This happens quickly and if not compensated for right away, will put the boat hard aground. At Breach Inlet, we found one spot that would be 4.5 feet at low tide. Since our transit coincided with a mid-tide and rising, the depths did not affect us. Once through the area and out into Charleston Harbor, the crew could relax. This was one of the smoothest crossings of the harbor yet. Not much boat traffic, light winds and the currents in the right direction. Once across the harbor, the waterway goes through Wappoo Creek and Elliott Cut. The bridges over Wappoo Creek are high enough for Beach House to transit without an opening. On this day, we again had the currents with us so even at near idle speed, the boat was doing almost 10 miles per hour. That meant the currents in Elliott Cut would be with us. Elliott Cut is a very short and narrow section of the waterway that has a very strong current that can reach 5 knots. Slow boats can find themselves struggling to make any distance against the currents or can feel like they are being shot out of a cannon into the Stono River if southbound. It's always a good idea to announce over the VHF radio when entering the Cut to let any large vessels know you are on your way. There is limited room to pass in the strong currents if you happen to encounter a tug and barge going the other direction. Around 1400 it was decided that we would call it a day. Beach House had covered 65 miles for the day, and we wanted to stop in Tom Point Creek (page 33, TGBOA, Norfolk to Key West) to set out a wind event that would last for the next couple of days. Entering the creek is straightforward, but on the starboard side at the first curve is a shallow bar that is dry at low tide but covered at high tide. The tidal range here is 7 to 8 feet, and the winds can affect the tides even more. To our surprise, two other boats followed us in and anchored farther upriver. The anchor set quickly in the mud, but with the required scope to allow for high tides, the creek was looking a little narrow for the forecast winds. Reports said we could expect 25- to 35-knot winds with higher gusts. We anchored behind a treeline, but it was some distance off the creek and the winds would blow across the creek instead of up or down. 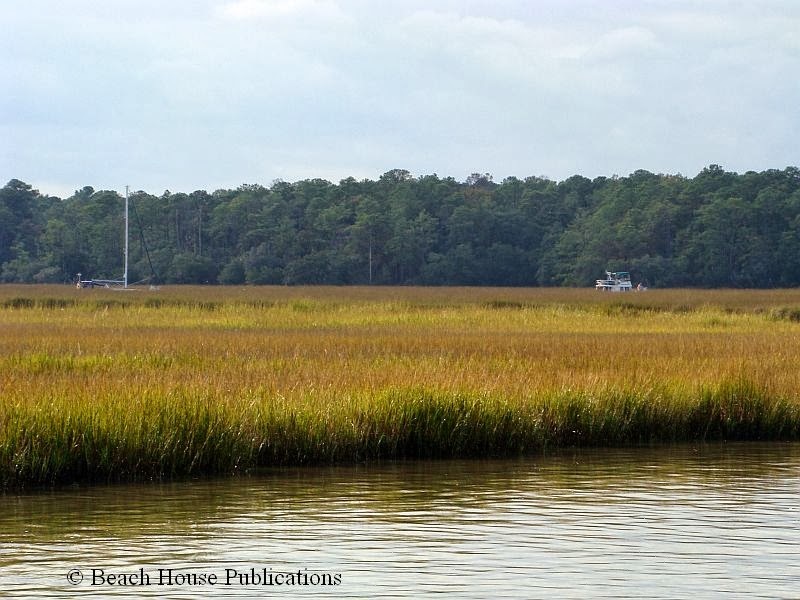 Our concerns were justified when the next morning Beach House was sitting with her stern almost in the marsh grass and in the mud. The winds were a steady 20- to 25-knots, but we knew we needed to re-anchor. Not a fun prospect in these kinds of winds, let alone in a narrow creek. There was no danger, but if the anchor should break loose, it could get serious. Moving slowly and carefully, the anchor came up and we moved farther up the creek just as the two other boats that came in were leaving. We found a wider spot about a quarter mile in that was a bend in the river where the wind direction would be better. (Meaning it was coming up the river and not across it.) 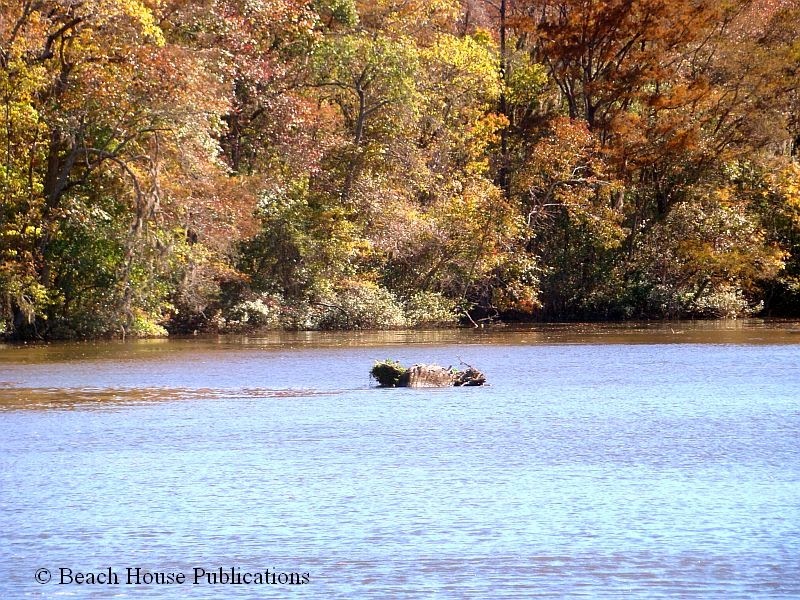 There is a house on the river and a stand of trees very close behind the house. When the tide and current switched we would be sitting sideways in the current but at least not being pushed into the river banks. This proved to be a good move and the next two days were comfortable despite the windy conditions. The winds finally let up and off toward Beaufort, SC we went. The ICW along this route is very beautiful and remote. The distance to Beaufort is about 62 miles and would take us about 5 hours with favorable currents. Today the currents would be with us. Two areas along this route need to be negotiated carefully and should probably be done at mid-tide or higher. Watts Cut has often been reported as very shallow, but many of these reports might be attributed to the swift currents pushing boats out of the channel. It is a very narrow cut and paying attention to what is happening behind the boat can better show whether the boat is being pushed by the currents. The rivers on each side of the cut will have swift currents. The other problematic area is the Ashepoo-Coosaw Cut. This cut is notorious for shoaling, and even regular dredging only helps for short periods. The biggest issue is coming out of the cut into the Coosaw River. The depths north of R "184" would be 6 feet at low tide and even down to 5.7 feet a little way out into the river, the shallowest depth we found in this area. Once well out into the river, depths drop quickly and the river is wide and deep all the way to Brickyard Creek. The Ladies Island Bridge is a welcome sight and means the day is almost over. A turn into Factory Creek (Page 37, TGBOA, Norfolk to Key West) brought Beach House to Lady's Island Marina, where we found Beach House and also where we called home for over a year and a half. (That's another long story, which we have written about extensively in this blog.) We spent a week here catching up with old friends, then continued on. View photos, cruising news and lots of interesting information on our Facebook page. Don't forget to click the Like button. Ah, Osprey Marina. One of our favorites too! We'll be back there in March for a three week stay. We've been using Skipper Bob, but I think I will grab a copy of your book. What area does it cover?